Note: We are no longer sending groups of volunteers to our sites. Please check back with us for future opportunities. Allyson with Irma and her relatives. I am a fourth year Anthropology major at the University of California, Los Angeles. Traveling is something that I love to do, but even more so I love serving my community, both domestically and internationally. I recently went on a 10 day, international build coordinated by Homes from the Heart in December of 2013. I must preface this article by saying going to El Salvador with the goal of building homes was one of the best opportunities I have acted upon in my college career. Homes from the Heart introduced my team and me to a village, Chiltiupan, high in the mountains about two hours from the capital, San Salvador. This is where I met Irma and her children, the recipients of the home we were going to build. We came to Chiltiupan on a Monday to an empty patch of ground behind Irma’s old home situated on an incline. For the next few days, my team, other volunteers, and a team of local construction workers got to work. The first day was all about foundation. We leveled out the incline, dug trenches, and set posts in order to build the walls. This house was unique in that it was not built of wood or brick but comprised of concrete tablets, called tablas, that were designed to fit together like puzzle pieces. I must take a moment to talk about the actual building. Being that we were so far up in the mountains with small unpaved roads, it would have been too difficult to transport modern machines to aid in building. This meant everything was done by hand: leveling the ground, mixing cement, lifting and piecing together the tablas, etcetera. To put this in perspective, each tabla was several hundred pounds and had to be carried by four men. The walls were at least ten feet high so we had to lift these tablas over our heads and then carefully slide them between the posts. This trip gave me a greater appreciation for construction workers and the work that they do. By Friday, there were four walls in place and a level floor. After my team and I left, work did not stop. As of the time of writing, Irma and her children have a roof and near finished kitchen area! 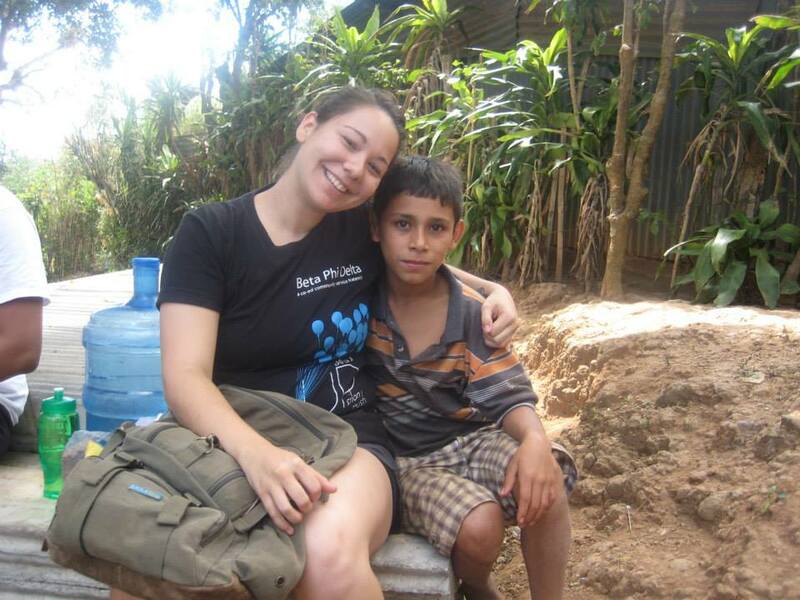 Allyson with Jesús, one of Irma's children. This trip was not only about work; there was some play too. We had lunch on site, and during this time we would play with the neighborhood children. They loved taking pictures with our cameras! Some of the best photos of my trip came from the kids. We also had days off where fun activities were planned. We went ziplining and hiking, had surfing lessons, and visited Mayan ruins in Tazumal. Probably one of the best features was our accommodations, which was a beach house in Playa San Diego, about 40 minutes from San Salvador. Our back gate opened to the beautiful sandy beach! Every day my team and I would come home tired and usually covered in dirt to run straight to the beach to relax and swim. Afterwards, we would hop into the pool in our backyard and wait for our awesome cook, Luz, to prepare dinner. Luz was such an incredible cook and nice person. I miss her cooking!